Don't expect to see Donald Trump sit down with Seth Meyers anytime soon. Meyers banned the presidential candidate from his show on Tuesday night in solidarity with the Washington Post. 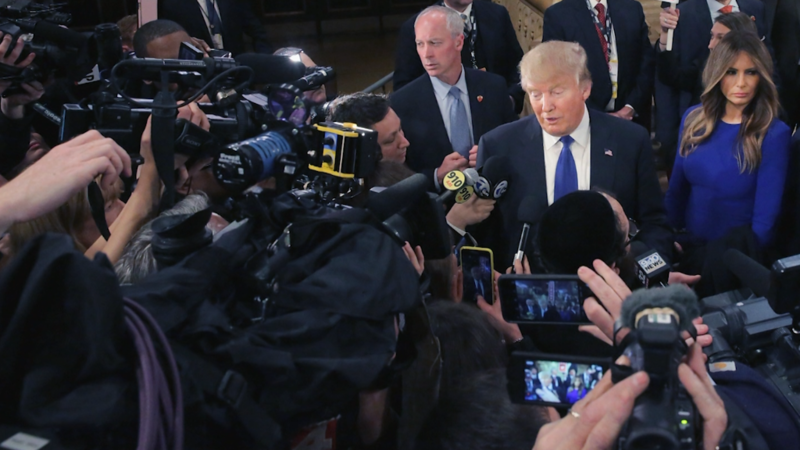 Trump revoked the newspaper's press access at his campaign events earlier this week. "We here at 'Late Night' believe in freedom of the press so therefore have decided to stand in solidarity with them," Meyers said during his "Closer Look" segment. The NBC host and former "Saturday Night Live" cast member did concede that Trump was probably never going to come on the show anyway. Meyers and Trump have a history with one another. Meyers lambasted Trump when he hosted the White House Correspondents Dinner in 2011. "Donald Trump has been saying that he's running for president as a Republican," Meyers said at the time. "Which is surprising since I just assumed he was running as a joke." Trump, who was at the dinner, later told the New York Times that Meyers had no talent and that his "delivery was so bad that he hurt himself." Meyers took over as host of NBC's "Late Night" from Jimmy Fallon in February 2014. The "Late Night" host has not held back from lampooning Trump since the former reality star and mogul started his campaign for president. Meyers has done long segments on Trump regarding Trump University, his comments on abortion, and his stance on the Iraq War. The host mocked Trump again on Tuesday night comparing him to Joseph McCarthy, the Cold War era senator famous for fueling the blacklisting of people suspected of being communists. "He's like if Joseph McCarthy was exposed to gamma radiation and became a racist orange Hulk, but with tiny hands," Meyers said.